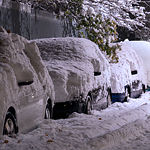 There are a few different reasons why batteries die in winter temperatures. In cold temperatures, the battery is under a heavier load when starting the vehicle. Second, the capacity of a battery gets reduced in colder weather. Also, the increased use of car accessories, such as wipers and headlights, adds an additional strain on batteries. These all contribute to the reduction of your vehicle’s battery life. There are negative effects that occur in the summer as well. Heat in the air tends to overheat the electrolytes in the battery. This causes them to evaporate leaving the battery without a sufficient level of fluid. Thus, it is important to top off your battery fluid during the summer heat. Grand Blanc Motorcars can help you resolve any battery issues with your vehicle. Don’t take chances with your vehicle’s battery.